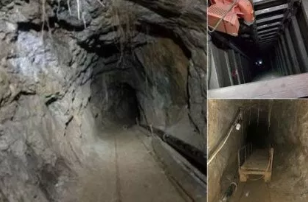 BAJA CALIFORNIA, Mexico -- The U.S. Border Patrol says agents discovered a solar-powered tunnel running under the U.S.-Mexico border, CBS Los Angeles reports. Mexico state police and military units found the incomplete tunnel last month while conducting an operation in Jacume, Baja California, Mexico. It was found at a home located approximately 221 feet south of the international boundary, according to U.S. Customs and Border Protection (CBP) spokesman Ralph DeSio. Mexican officials took over the tunnel and authorized U.S. Border Patrol's Western Corridor Tunnel Interdiction Group to enter the tunnel in order to map it and determine if the tunnel had an exit point in the United States, DeSio said. The tunnel is massive by most standards. Agents found the tunnel entry point had a shaft approximately 31 feet deep, with a total length of 627 feet, of which 336 feet were in the U.S., according to DeSio. The tunnel's exit shaft, however, did not break the surface or have an exit point into the U.S. Agents found that the tunnel had a rail system running its entire length. They also found that solar panels powered electrical, lighting and ventilation systems in the tunnel. It's unclear whether any arrests were made following the discovery.